Shooting straight off the East Village into north Brooklyn, the L train is almost like a road map of gentrification and future rent hikes. For years now, the city's budget-conscious and/or artistically inclined have found accommodation off the L, and as landlords have hiked prices, they've steadily moved stops farther from Manhattan, ​adding a few minutes to the commute to save on rent. The pattern is so well-established that the L has earned the nickname "the line of gold" from Andrew Barrocas, founder of the real estate brokerage MNS. But, as news came last week of rents in Brooklyn rising once again, we wondered: how much do you actually save if you move a stop down the line? At what point will you really see a break on rent? And what kind of apartment will you get? 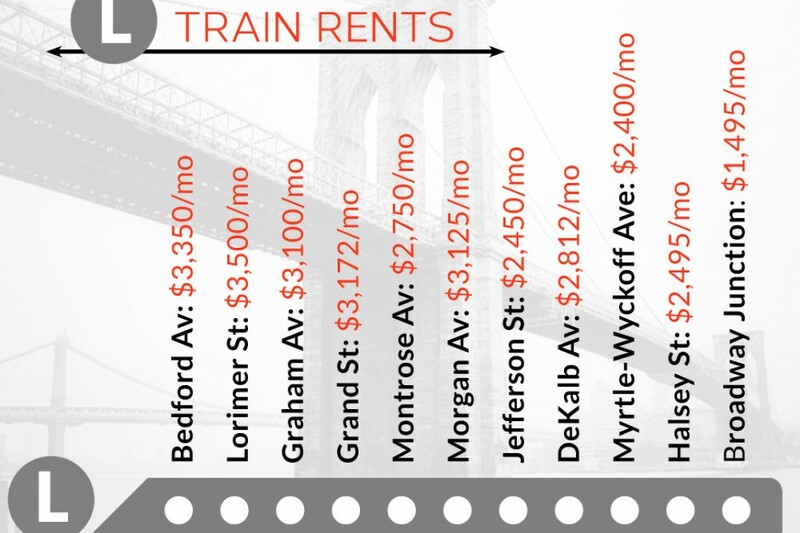 As a rule, moving farther East from Manhattan (or the Bedford stop) will save you some cash on rent, though there were a few surprises in the numbers: rent near Lorimer, two stops into the borough, is actually higher than near Bedford, Williamsburg's pricey epicenter--$3,500​ per month versus $3,350 per month, respectively. StreetEasy data scientist Alan Lightfeldt chalks this up to the mix of apartments on the market right now, not "a significant cooling of renter interest in Bedford or Lorimer," he says. "These neighborhoods are among the most expensive to rent in Brooklyn." For example, expensive new developments like 55 Hope Street--where a two-bedroom goes for $3,950--could skew the data from month to month. "In Williamsburg, listings are dominated by one-bedrooms," says Lightfeldt, "whereas at Halsey, you can find very large units with more bedrooms. Even though the total rent might be higher than you expect, the rent per room is quite low." Another thing worth remembering: aside from the cost, you may have a more difficult time finding an apartment further down the line, as there are fewer developments and housing stock tends to be more variable. In fact, there were so few listings for the areas around the Wilson and Bushwick Avenue-Aberdeen stops that StreetEasy didn't have sufficient data to come up with averages. Both stops are wedged in tightly between Halsey and Broadway-Junction (meaning there was a lot of overlap), and not a ton of new buildings have gone up there in the past couple of years. At 101 Bedford Avenue, you can get a 1-bed, 1-bath in an amenity-laden new development for $3,350/month. For better or worse, this is the heart of Williamsburg. The apartments tend toward the small and expensive (other than the ones in new luxury buildings, which are large and even more expensive). While you can't argue with the convenience--it's easy to get to Manhattan in just a few minutes or opt for a far more pleasant commute by East River Ferry, and there are scores of options for bars, restaurants, music venues, shops, gyms, etc.--you'll be sharing the convenience with crowds that are nearly on par with Times Square, particularly on the weekends. It'll never be boring, but the artists who made it a destination in the first place are long gone. 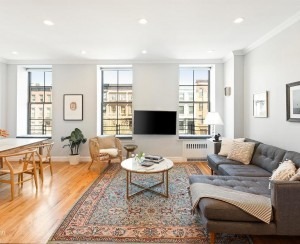 One example of the high-priced buildings driving up prices around Lorimer: this 2-bedroom at 487 Keap Street, which is asking $4,500/month. Long the laid back neighbor to Bedford, the area around the Lorimer stop is just a short walk away, and has more than its fair share of places to grab a meal or knock back a few beers. Lacking the same weekend crush of tourists, it's probably the more pleasant place to live. A lot of people have figured this out already, though, and prices for the area's often rundown older apartments have shot up along with rents at the expensive new developments. A little cheaper than the neighborhood's median rent, this 1-bedroom at 139 Skillman Avenue is on the market near the Graham stop for $2,800/month. Only a few blocks farther out than Lorimer, the area around Graham has its own row of restaurants and bars all along Graham Avenue. It seems a new one opens up every day, but maybe that's just us. You'll find much the same crowd as at Lorimer, with a few more longtime residents. 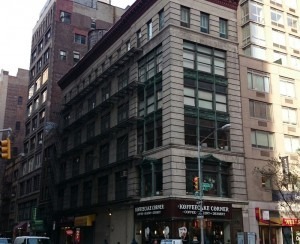 At 14 Judge Street near the Grand stop, a 2-bedroom apartment is on the market for $2,650/month. A little farther south and a little more removed from the area brokers have taken to calling "prime Williamsburg," the area around Grand has a large Hispanic population (and thus, a lot of excellent Hispanic food), and a more even mix of old and new neighborhood residents. There's a huge new grocery store (and plenty of nightlife) right on Grand Avenue, so while it's less of a destination in its own right, you'd be set for your day-to-day needs. The price on this 1-bedroom condo at 180 Scholes Street near Montrose recently dropped by $120 to $2,630/month. This is the first area that sees a significant drop-off in price, and it makes some sense--Montrose lands between Williamsburg and Bushwick's epicenters, and is relatively removed from both. Still, several new bars and restaurants have cropped up in the past year or two, and there's reliable, old-school Italian food nearby, too. It's also a short walk to beloved local watering hole The Anchored Inn and stalwart venue Shea Stadium, as well several other, generally unnamed warehouse venues. If DIY shows are your thing, you'd be pretty well situated. The trade-off of paying more than could ever seem fair for a room in a glorified warehouse in a neighborhood with little green space? Having Roberta's as your neighborhood pizza spot--pro tip, they take to-go orders--as well as access to art galleries and studios, vintage shops, some of North Brooklyn's best food options, a surprisingly wide range of bars and an honest-to-gooodness chocolate factory. This part of Bushwick is a destination in its own right, rather than just a stepping stone to Bedford, and the prices match. The apartments here tend toward the large and loft-like, so be ready to share. If you've got $3,200/month to drop on a studio loft space(!! ), you can live right next to the Jefferson L stop at 385 Troutman Street. Truthfully, we're surprised prices here weren't a little higher. Just as Lorimer has gotten some of the calmer runoff from Bedford's occasional "Disneyland for adults" vibe, the area around Jefferson tends to feel more like a neighborhood and less like a tourist destination than Morgan. (So much so that it's earned its own, controversial nickname: "Jefftown.") It's also home to an ever-expanding roster of good restaurants like farm-to-table mainstay Northeast Kingdom--well worth a pilgrimage--plus a couple of health food stores, small art galleries, huge new venue Radio Bushwick and, you guessed it, a whole lot of bars. Considering the amount of time you'll want to spend in the immediate neighborhood, this is one of the better deals in Bushwick. For $2,000/month, this 2-bedroom at 300 Harman Street is equidistant from the DeKalb L and the Knickerbocker M train. The area directly around DeKalb feels a little more residential than its environs, and your neighbors are as likely to be families as they are young people with $3,000 a month to burn on rent. According to StreetEasy, the past year saw a major influx of larger apartments with more bedrooms, which would explain a 22 percent spike in median rent compared to May 2013 (and its higher median asking rent than the generally more popular area around Jefferson). It's got solid grocery stores, so your basic errands should be taken care of, even if you end up making the five-minute walk over to Jefferson for most of your entertainment. If you opt for a newer condo building like the one at 358 Grove Street, you'll still pay as much as $2,095 for a 1-bedroom even as far out as Myrtle-Wyckoff. The basics will be covered here--drug stores, groceries, good delis, a gas station--and there is the added bonus of being able to catch the M nearby, not just the L. But the elevated train makes the area noisy, and other than a couple of reliable cafes and restaurants (as well as many top-of-the-line taco stands), this tends to be an area people commute out of in their off-hours. You could end up with the entire floor of a house or a cramped, oddly shaped (and overpriced) apartment here--the housing stock is hugely varied, which means a fair amount of options, but also that you should read between the lines on listings. Assess your options carefully, and you'll likely be able to find yourself a solid deal. This apartment at 312 Weirfield Street is more expensive than the Halsey median, at $3,300/month, but with four bedrooms, the cost averages out to $825 per person. We've heard rumblings that condos are on the way for the Halsey stop--based precisely on the assumption that people will keep moving farther out along the L--but for now, it's primarily a place to land yourself a cheap apartment, rather than a destination. Bushwick Daily recently interviewed a Halsey transplant, and if there's any main takeaway, it's that it'd be a solid place to move with friends or a significant other, but a little lonely to do on your own. Paying $1,000 per person doesn't seem cheap to live as far as Wilson, but then, $4,000/month for an entire house (this one's at 244 Covert Street) could be considered a deal. There weren't enough listings to come up with a median rent for Wilson, which is just a few minutes' walk from the Halsey stop, and borders the Irving Cemetery. However, worth noting that it's right next to Ridgewood, which might be the more convenient option for shaking up your food and nightlife routine than heading back into Bushwick. About equidistant between the Wilson and Bushwick Av-Aberdeen stops, this 4-bedroom duplex at 113 Schaefer Street is asking $3,595/month. Again, no median rent available here. It's important to keep in mind that while brokers might try to sell apartments here as part of Bushwick ("Hey, Bushwick's in the name of the subway stop! "), Bushwick Av-Aberdeen is really closer to the Ocean Hill section of Bed-Stuy (as well as the Chauncey J, Z, which will give you some flexibility for neighborhood hopping), and borders the Evergreen Cemetery. In Ocean Hill proper, this 5-bedroom duplex at 217 Hull Street is on the market for $2,700/month, or $540 per person. So, how far out do you have to go for the rent to really start dropping? Broadway-Junction, a hub of trains that acts as the border between Bed-Stuy and East New York. You can catch the A, C, L, J, and Z here, and it's a stone's throw from the East New York LIRR station. When there are listings up you can definitely find a cheap deal (availability seems to vary, as with the areas surrounding Wilson and Bushwick Ave-Aberdeen), but it's a long way from even the farther flung areas of Bushwick.